Sun, 15 Feb 2009 | Published in I Was There . 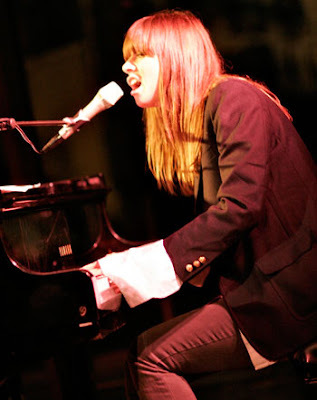 . .
Last Friday, one weekend before Valentine’s Day, Cat Power performed for a very romantic crowd packed tightly in the toasty Apollo Theatre. The best way I could describe this experience was that it was true to the vibe and feeling Cat Power creates on their albums… but not much more than that. Bathed in darkness, Chan Marshall’s cool, smoky voice carried very well to the quiet crowd but there was little stage presence to put with it. I had been looking forward to seeing her recite these lyrics and smile at us a few times, but we couldn’t really see any of that. It also wasn’t clear which songs were coming or going; moreover, it was more of this continuous, uninterrupted Cat Power vibe reaching every corner of that theatre. Marshall said little to the audience, except for, “God bless James Brown”, which received a vibrant applause. I felt as though Marshall and her bandmates put everyone in that theatre in exactly the same mood. In the end, I felt like I’d gone to more of a listening party than an actual performance.